Barely 200 years ago, John Pray and his family first arrived at the future site of Waterville as settlers. On Wednesday, April 24, “An Evening with John Pray, Esquire: The Founder of Waterville” will be presented by Jim Conrad, WHS President and re-enactor. The program is free to the public and will be held at StoryPoint Retirement Community, 1470 Pray Boulevard in Waterville at 7:00 PM. Pray’s small party consisted only of himself (age 34), his 28 year-old wife Lucy, four children ages 14 months to seven years, and an 8 year-old nephew. They traveled by wagon from Smithfield, New York to Buffalo and by schooner to the site of Fort Meigs. A day later they found sanctuary at a spare cabin built by settler James Calendar Adams at the corner of Dutch and River Roads. The program seeks to portray the events surrounding the development and growth of Waterville as seen through the eyes of Pray—explorer, speculator, farmer, realtor, and industrialist. In keeping with his sense of humor, every attempt will be made to humanize and breathe life into this extraordinary visionary. Old Homes of Waterville Has been canceled. “Old Homes of Waterville” offers a look at several dozen of the city’s most interesting landmarks. Selections were based upon historical significance, who lived there, changing architectural styles and availability of “before and after pictures,” that is, both vintage and current photos. The program is free and open to the public. Local historian Jim Conrad is a native of Waterville. He taught American history in the Toledo Public School System for thirty-five years and currently serves as President of the Waterville Historical Society. The programs are free and open to anyone 50 years or older. Reservations are required and may be made by either visiting Browning’s Registration Event on the campus from 2:00 to 4:00 on Tuesday, March 5. OR by simply calling Molly Good at 419-360-5141. The Open Houses will be held at our two historic homes, Robbins and Sargent houses on River Road. The Downtown Walking Tour begins at 9:00 at the Robbins House, and the Uptown Tour begins at 12:00 at Wakeman Hall. The Wakeman Archives will be open from 10:00AM-2:00 PM. The 2019 displays at the Wakeman Hall will feature D-Day and will have the front page of the Blade for June 6th, 7th, 8th, and 9th of 1944. There are also WWII Army and Navy uniforms located at Wakeman. The downstairs of Robbins House will feature businesses of Waterville with a baseball uniform, Koral t-shirt, pictures and artifacts of the businesses here. There are also binders with pictures and ads from the last hundred years. A new exhibit in the upstairs at the Robbins House is recognizing the contributions of local, national and international efforts to win universal suffrage for women. While the exhibit for April and May will concentrate on the Suffrage Movement, later exhibits will feature women who distinguished themselves in all areas of endeavor, as well as recent efforts to win equal rights for women worldwide. The June 15th Historic Home Tour tickets also available here online under Join and Give. George B. Rheinfrank (1874-1960), designed many notable buildings in Toledo and the surrounding area, some of which still survive and some have been lost. The architectural drawings discussed are part of an unknown collection that was discovered in 2017 and acquired by the Toledo Lucas County Public Library. Presented by Edward T. Hill, Special Collections Librarian, Curator of the Blade Rare Book Room and the library's noted architecture collection of books, drawings and related materials. Open Houses will be held at our two historic homes, Robbins and Sargent houses on River Road. The Downtown Walking Tour begins at 9:00 at the Robbins House, and the Uptown Tour begins at 12:00 at Wakeman Hall. The Wakeman Archives will be open from 10:00AM-2:00 PM. The 2019 displays at the Wakeman Hall will feature D-Day and will have the front page of the Blade for June 6th, 7th, 8th, and 9th of 1944. There are also WWII Army and Navy uniforms located at Wakeman. The downstairs of Robbins House will feature businesses of Waterville with a baseball uniform, Koral t-shirt, pictures and artifacts of the businesses here. There are also binders with pictures and ads from the last hundred years. A new exhibit in the upstairs at the Robbins House is recognizing the contributions of local, national and international efforts to win universal suffrage for women. While the exhibit for April and May will concentrate on the Suffrage Movement, later exhibits will feature women who distinguished themselves in all areas of endeavor, as well as recent efforts to win equal rights for women worldwide. Yet again will the Ghosts of Wakeman Cemetery arise to tell their stories. Don’t miss this enlightening, humorous and sometimes spooky set of tales from Waterville’s denizens of the past. “Old Homes of Waterville” offers a look at several dozen of the city’s most interesting landmarks. Selections were based upon historical significance, who lived there, changing architectural styles and availability of “before and after pictures,” that is, both vintage and current photos. The program is free and open to the public. Please RSVP to StoryPoint at 419.878.1000. Local historian Jim Conrad is a native of Waterville. He taught American history in the Toledo Public School System for thirty-five years and currently serves as President of the Waterville Historical Society. Annual Christmas Dinner will be held at the Fallen Timbers Golf Course Club House for Members & Friends. Save the date: Thursday, Dec. 6, 6:30 PM-StoryPoint Senior Living. See attached invitation and RSVP today! Enjoy food and drink as you learn about WHS' vision and goals. Light up Waterville will be held in Uptown Waterville on Third Street! Spread some holiday cheer with all your friends and family! There will be lighting of the Christmas tree between Clayful Arts and the Hall of Framers at 6:00 pm. John Pray will be there to share Waterville Christmas stories and traditions around the fire pit. Galati Photography will have his Christmas booth there to take pictures. Santa Claus will be there. There will be music, food and beverages. Bring your friends and neighbors to help us usher in the holidays in Waterville. Hope to see you there! There will be election of officers and annual meeting of the Waterville Historical Society, followed by a talk by Al Geha on Art Stolen by Nazis during WW II. This will be the final program of 2018 with the presentation of “Art Stolen by Nazis in World War II”. Al Geha of Waterville will cover the relationship of stolen and looted art that began before the outbreak of and during WWII. Mr. Geha is retired from the Medical College of Ohio Dept. of Pathology, and is a docent at the Toledo Museum of Art. The program will begin at 7:00 pm at Wakeman Hall, 401 Farnsworth Rd, is free and open to all, and will be followed by refreshments. Back by popular demand, some of “residents” of Wakeman Cemetery will return to join us live on Wednesday, October 17, 6:30 PM for a fifth year of “Ghostly Encounters.” You will be introduced to some famous Waterville residents who reside right there in the cemetery and come alive on this one night to share their stories with us. They are a varied bunch with tragedy and comedy in equal measure, but always an interesting side to our city and its origins. Bring a lawn chair to sit on & a blanket to ward off chills! Our stage will consist of a grassy, relatively level and grave marker-free area. In case of inclement weather, come to the Wakeman Hall, 401 Farnsworth Road at 7:00 p.m. Thanks to the Waterville Gas & Oil Company for allowing free parking in their lot across the street. Refreshments served at Wakeman Hall, 401 Farnsworth, after the presentation. Back by popular demand, some of “residents” of Wakeman Cemetery will return to join us live on Wednesday, October 10, 6:30 PM for a fifth year of “Ghostly Encounters.” Rain Date: October 17th. 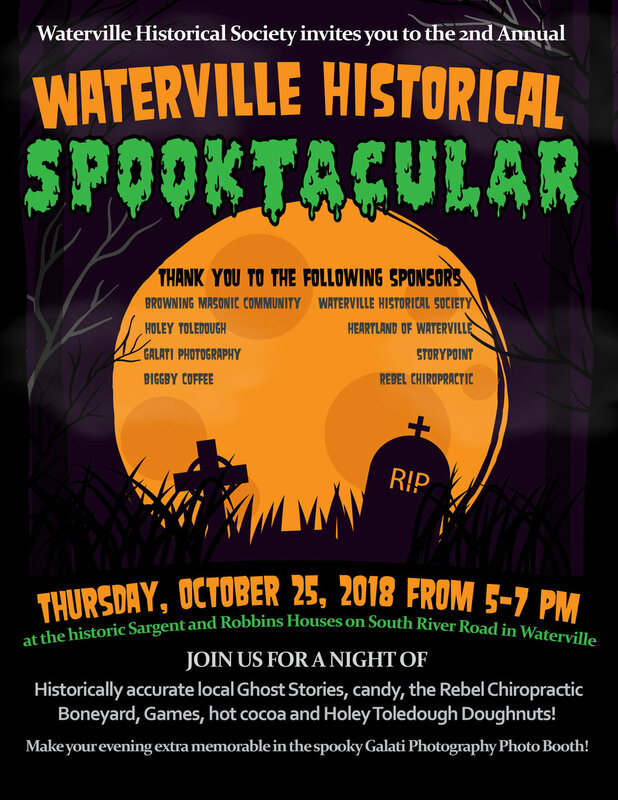 You will be introduced to some famous Waterville residents who reside right there in the cemetery and come alive on this one night to share their stories with us. They are a varied bunch with tragedy and comedy in equal measure, but always an interesting side to our city and its origins. Bring a lawn chair to sit upon & a blanket to ward off chills! Our stage will consist of a grassy, relatively level and grave marker-free area. In case of inclement weather, come to the Wakeman Building, 401 Farnsworth Road at 6:30 p.m. Thanks to the Waterville Gas & Oil Company for allowing free parking in their lot across the street. Refreshments served at Wakeman Hall, 401 Farnsworth, after the presentation. Wakeman Archives is located upstairs at 401 Farnsworth Road, contains records of Watervile organizations, businesses, churches, schools, etc., as well as family files and local history. The public may inspect them free of charge and a volunteer archivist will assist with research. No items may be removed from the archives, but copies may be made for a small fee. Donations of similar documents and photographs, or items brought to be copied and added to the files are welcome. To schedule an appointment at other times call: 419-265-4871. This years theme for Waterville Historical Society will be "Salute to our Historic Heroes"with re-enactors from 1794, 1812, Civil War and WW I. Our River Road Campus will have a military theme and be filled with military vehicles, military music, living history interpretations, historical crafts, and displays and “the homefront” in honoring the US military over 240 years. The Robbins House will have a WW I Exhibit featuring military artifacts and home front exhibits. Photo booths sponsored by Galati Photography. Retro candy store sponsored by Browning Masonic Community. Face painting and More! The Robbins House and Sargent house will be open for tours on August 25th from 9am-12 noon. The WWI exhibits will be in the Robbins House for viewing. There is a picture of Esther “Glee” Pollock (1892-1918) on display. She was the eighth child of James and Mary (Barnett) Pollock. She attended the Barnett School, at the corner of Heller and Box Road and later taught school for a short time near Waterville. “Glee” decided on a nursing career. She graduated from the old Flower Hospital School of Nursing on June 1, 1915. She served as an Army nurse in World War I. In 1918 while stationed in Kentucky she caught the “flu” and on October 13, 1918 she died. This was during the nation-wide influenza epidemic that killed thousands across the country. There is a WW I nurses uniform in the upstairs at the Robbins House that probably many of the nurses wore during this time. The downtown tour will meet at Robbins House at 10 AM for a shuttle ride and the Uptown walking tour meets at Wakeman Hall at 12 noon. The Wakeman Archival Research Center will be open from 10 AM to 2 PM on Saturday as well as every Wednesday from 10 AM to 2 PM. This event is free and open to the public. Come and join us! Special guests invited to view the exhibits in the Robbins and Sargent House museums at 114 and 118 S. River Road, include the hundreds of AW Alumni who are still in the area or may be visiting from afar.. The Waterville Historical Society presents a “John Pray Day” Celebration in Conrad Park to commemorate the arrival of John Pray to our area 200 years ago in 1818. Activities will take place from 2-5:00 and will include a Bounce House, Kids games and yard game, face painting and education opportunities for kids of all ages as well as John Pray himself telling stories. Then, from 6-8:00, the Waterville Friends of the Library, Waterville Historical Society and Heartland of Waterville are hosting a “Music in the Park” featuring Buddy Love & the Coconuts. Eric's Ice Cream and Rosie's Rolling Chef will be serving up fresh deliciousness during the concert. What a great way to spend a Sunday in your own hometown! Wakeman Archival Research Center will be open from 10 AM to 2 PM. Always look for the Open Flag! Don’t miss the new WWI displays at the Robbins House at 114 S. River Rd. in Waterville. On the first floor are mannequins with uniforms and a very special set of stereographic photos of both Allies & Axis soldiers. Upstairs features displays on propaganda, life on the home front, and information on the Red Cross, including an authentic nursing uniform. Plus, the Sargent house next door has a new display of tools that came from the Rupp Canal Store. Lots to see and learn at our River Road campus!! The Wednesday, May 16 program from The Waterville Historical Society will be “Finding Your Relatives Using Online Cemetery Resources”, by Don Hengen. This free program will be presented at Wakeman Hall, 401 Farnsworth Road in Waterville at 7 p.m. The program will cover two national and several other local cemetery indexes that are found on the internet. Also the use of Findagrave.com. Mr. Hengen is a native of Nebraska, but has been in NW Ohio for 30 years, and has spent much of his retirement traveling the Midwest researching his descendants. He is a member of local Genealogy Societies and has served as president of the Genealogy by Computer Society. He began contributing to Findagrave in 2009 and has photographed 4 cemeteries and half of two others, including Waterville’s Wakeman Cemetery. Robbins & Sargent Houses + exhibits open from 9 AM to Noon. The exhibits will be an overview of WW I and the local participation in it. Many of the items will be that which Al Graf brought back from overseas. Bill Albert will have a display of stereoscopic pictures and viewers that visitors will be able to use. June 25, 2018 will mark the 200th anniversary of John Pray’s arrival to Waterville as a settler. In recognition of his role as the city’s founder, the Waterville Historical Society will sponsor several events this year in his honor. On Wednesday, April 18, “An Evening with John Pray, Esquire: The Founder of Waterville” will be presented by Jim Conrad, WHS President and re-enactor. The program is free to the public and will be held at Browning Masonic Community, 8883 Browning Drive at 7:00 PM. We are ready to announce our first 20% of everything at Granite City on Sunday, March 25th will be donated to WHS. Granite City Food and Brewery is located near the theaters at Fallen Timbers Mall. We have been promised that no other organizations will be permitted to share "our day." The trick is that you must tell the server or give him/her the flyer that announces our benefit. The 20% includes alcoholic beverages along with all else. Brunch is 9 AM-2 PM; menus available all day from 9 AM-9 PM and this counts on carryout orders as well! Print out flyer as reminder or to share w/friends.